Welcome to today’s digital workforce that requires a new work environment, one that is collaborative, mobile, and smarter. The office environments of today are retiring legacy wired networks in favor of pervasive wireless environments that feature ultra-fast Wi-Fi, the Internet of Things and mobile unified communications. Today’s innovation inducing work environment is all about sharing ideas faster throughout your organization in order to seize new opportunities, before competitors beat you to it. Just like the traditional data center that was saddled with fixed stationary infrastructure that was inflexible and expensive to support, the wired work space of yesteryear was confining to collaborative expanding workflows. Employees were forced to gather where the cable was. This spatially imposed limitation was justified in the name of speed, management, and security. Thanks to the continued advancement in wireless technology from industry leaders such as Aruba, there is no reason to accept stationary tolerance. 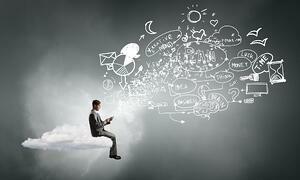 Enterprise Mobility is no longer a perk; it is a necessity that is expected by your employees. It involves more than merely broadcasting one or more SSIDs for employees to connect their devices and provide connectivity. Simply providing mobile access to check one’s email today is insufficient at many levels. Your wireless network is the infrastructure that creates the framework for your office’s digital workplace. By implementing a modern day smart wireless infrastructure, IT leaders can shape their companies’ employee experiences and boost productivity. In a recent study conducted by the Economist Intelligence Unit titled, “How CIOs can Contribute to Business Performance by Shaping the Employee Experience,” a mobile-first environment can bring several benefits to your workforce. In the same manner that companies are restructuring their enterprises into a cloud-first hybrid architecture in order to match workloads with environments, organizations are restructuring their workplaces into mobile-first architectures in order to match employees with the right technology and applications. In the same way that organizations have embraced the cloud, it is time to embrace workspace mobility. Not just any wireless system will do, however. Today’s wireless networks must be able to handle high density environments for the multitude of devices that users carry on them, along with the growing IoT fleet of devices that companies are integrating into their enterprises to create smart environments. Today’s mobile office environments must be able to enable collaborative workspaces, intelligent meeting rooms, and a self-service environment in which users can quickly locate their applications and resources. This necessity for integrated intelligence must go beyond the user experience, however. From a management perspective, the wireless network systems that today’s mobile office environments are built upon must be able to dynamically analyze traffic loads and respond to network performance issues in automated fashion. From a security standpoint, they must be able to provide blanket-like 360 degree coverage, allowing total visibility and control of the network for the plethora of users and devices that connect to it. Not just any wireless solution can meet these stringent requirements. Gartner recently identified HPE/Aruba as one of only two leaders in its Magic Quadrant for the Wired and Wireless LAN Access Infrastructure. HPE/Aruba also happens to be the second-largest vendor in the wired/wireless LAN access layer worldwide market. It offers both WLAN controller and controller-less architecture to accommodate any enterprise. Those who want to centralize control of their IPs amongst multiple environment can do so with their cloud offering called Aruba Central. HPE/Aruba offers far more than just access. The wireless LAN has evolved and transformed itself because the workplace that it supports has undergone a digital transformation along with the enterprise. Today’s modern-day work environments demand seamless communication, effortless user interaction, and automated intelligence-driven management and security. By empowering your employees, you gain a competitive advantage and HPE/Aruba can help you do just that. 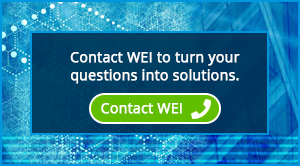 In the meantime, contact us today to find out how WEI, a trusted IT solutions provider, can help your organization find the best solutions for your organizational needs.